Everyone knows Lady Gaga for not only her music, but her theatrical stage performances and incredible, over-the-top fashion sense. Gaga’s Monster Ball Tour kicks of in the United States on July 1st in Boston, and her many set changes and over 15 outfit changes will definitely not disappoint audiences. With Gaga’s US tour dates quickly approaching, the lucky “Little Monsters” who were able to snag a coveted ticket to one of her shows definitely need to get started planning their outfits. Attending the Monster Ball this summer but stumped for what to wear? We’re here to help. What is the Monster Ball all about? We’ve covered concert attire (and music festival attire) here on CF before, but the Monster Ball is no ordinary concert. Gaga has said that she put every ounce of her creative genius into every aspect of the show, and designed it especially for her many adoring fans. As she always says, she wants each and every fan to express themselves through their outfits and attitudes when they come to her show. Essentially, the Monster Ball is a place where people can wear any outrageous outfit without being judged, as long as it makes them feel confident and liberated. Can’t wait to get started on your look for the show? I’ve got plenty of ideas and tips to get you started, but be sure to not take my ideas too literally. 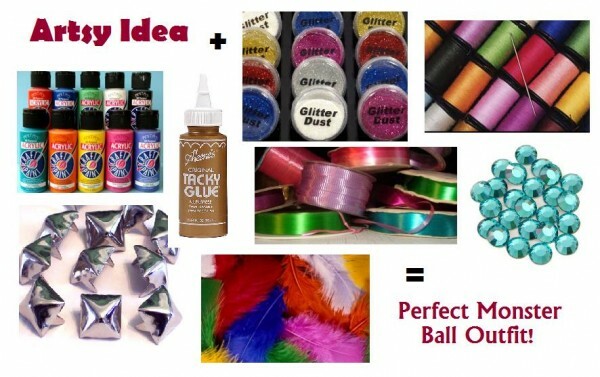 Your Monster Ball outfit should be all about you, so use your imagination and go crazy! 1. Don’t Be Afraid to DIY. The most outrageous of outfits for Lady Gaga’s Monster Ball cannot be found in stores, but rather are artistic interpretations formed in the mind of her “Little Monsters” which are translated to real life in the form of Do It Yourself projects. Of course, DIYing is more time-consuming than buying an outfit at a store, but it also gives you the most creative freedom. There are endless possibilities, and so many ways you can create a liberating, outrageous outfit to express yourself: you just have to be creative. For example, if you are obsessed with astronomy, you could incorporate the stars and the solar system into your outfit with fabric paint and glitter. There’s no way you could find something so original in stores. If arts and crafts are not your forte, do not get discouraged! There are plenty of things you can purchase, and even things you can find in your own closet, that you can put together in a creative way. Just be true to your own style and personality, and you can’t go wrong. 3. Get Inspiration from Gaga’s Favorite Looks. Lady Gaga can often be spotted in sunglasses, bodysuits, leggings, gloves, wigs, and sky-high heels. To add some Gaga Glam to your look, you could incorporate one of her signature items. Suggestions are below. 4. Recreate a Gaga Staple. For a middle ground between a 100% original DIY outfit and something bought at a store, why not DIY one of Gaga’s most iconic looks? There are tons of DIY tutorials online featuring step-by-step guides on how to make your own Gaga-inspired accessories, including her famous Hair Bow and Video Glasses. All it takes is a little research to find instructions on how to make whatever you’d like! Are you one of the lucky few who scored tickets to the Monster Ball? If so, what are you planning on wearing? Leave comments with your ideas!